The University of Toledo men’s basketball program will open and close its Mid-American Conference campaign inside Savage Arena. UT will open its league slate Jan. 5 vs. Ball State before closing its regular-season schedule with home matchups against Western Michigan March 5 and Eastern Michigan March 8. Jaelan Sanford is Toledo’s leading returning scorer with 16.3 points per game and has started all 100 games in a Rocket uniform. Kowalczyk and the Rockets will play defending league champion Buffalo, a team UT dropped a narrow decision to in the 2018 MAC Championship Game. 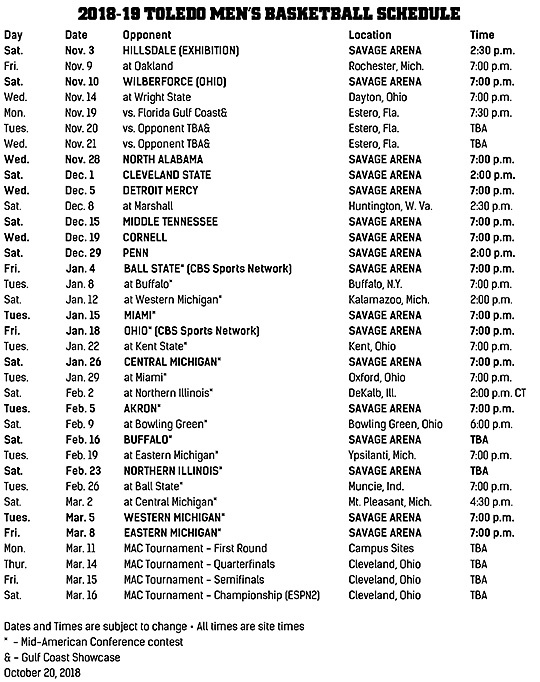 Toledo will visit the Bulls in Alumni Arena Jan. 8 before hosting UB in Savage Arena Feb. 16. Toledo also will face East Division foe Miami on two occasions, hosting the RedHawks Jan. 15 prior to visiting Millett Hall two weeks later Jan. 29. The Rockets’ remaining East Division contests will be single meetings at Bowling Green (Feb. 9) and Kent State (Jan. 22) and home matchups vs. Akron (Feb. 5) and Ohio (Jan. 29). The remainder of Toledo’s conference home games will include matchups vs. Central Michigan (Jan. 26) and Northern Illinois (Feb. 23). The Rockets also will play at Western Michigan (Jan. 12), Northern Illinois (Feb. 2), Eastern Michigan (Feb. 19), Ball State (Feb. 26) and Central Michigan (March 2) in their conference schedule. Kowalczyk has guided the Rockets to three 20-win campaigns in the last five years, marking the first time for this accomplishment since Bob Nichols recorded five straight seasons of 20-plus victories from 1976 to 1981. UT registered a 23-11 record with a 13-5 mark in league play last year and its 55 MAC victories over the last five seasons rank second in the league. The Rockets will return four starters in the 2018-19 campaign, led by seniors Jaelan Sanford and Nate Navigato. Sanford, a second-team All-MAC selection last year, ranked ninth in the league with 16.3 points per game and a 40.3 three-point shooting mark. Navigato set a school record last year with 94 three-pointers and led the MAC last season with 2.8 treys per game and ranked second with a 42.7 three-point percentage. 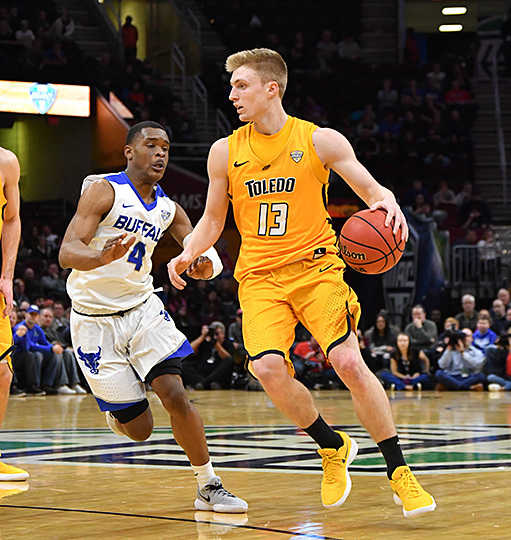 Also returning for Toledo will be the junior duo of center Luke Knapke (10.8 points per game, 6.3 rebounds per game) and forward Willie Jackson (7.6 points per game, 5.6 rebounds per game), as well as All-MAC Freshman Team member Marreon Jackson (8.0 points per game, 2.7 assists per game). The MAC Tournament will begin with first-round games at campus sites March 11 with the quarterfinals, semifinals and championship game March 14-16 at Cleveland’s Quicken Loans Arena. Toledo will open its 2018-19 campaign at Oakland Friday, Nov. 9, as part of a non-conference schedule that will see UT face a minimum of three 2018 NCAA Tournament squads in addition to perennial Conference USA frontrunner Middle Tennessee (Dec. 15). Toledo also will compete in the top mid-major tournament in the country when it travels to Estero, Fla., for the Gulf Coast Showcase Monday through Wednesday, Nov. 19-21. For ticket information, stop by the UT Athletic Ticket Office in Savage Arena, go to the Toledo Rockets website, or call 419.530.GOLD (4653). Full-time UT employees and retirees may purchase up to two season tickets at half-price. Additional season tickets may be purchased at the full price. UT students are admitted free to home games with ID. This entry was posted on Thursday, November 1st, 2018 at 3:42 am and is filed under Alumni, Athletics, Events, News, UToday .